I’m not the greatest fan of documentary films, and am of the belief that the hour generally given to such exercises on television is ample time. That’s not to say that I haven’t seen some excellent ones, but it takes some extremely interesting person or subject to fill the average ninety minute running time for such films and, unfortunately, these are few and far between. However the premise of The Greatest Movie Ever Sold piqued my interest because, whether we like it or not, it is something which effects us all, everyday, from the moment we wake until we put the light out – advertising! 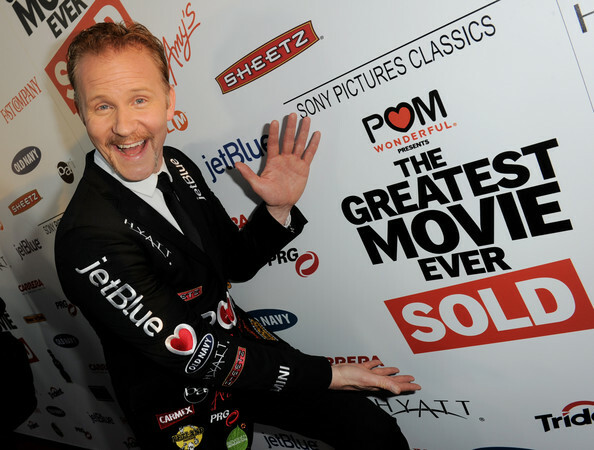 Morgan Spurlock, the director / writer who shocked junk food America with his expose of their eating habits in Super Size Me (2004) almost winning an Oscar in the process, does the same again with the advertising industry, specifically in relation to the stranglehold it has on films and Hollywood in particular. This time he goes out to discover why companies are increasingly pushing their products on the public subliminally by placing them within the setting of films without, a lot of the time, the audience even realising it. Having sat through this you feel you have been watching a horror movie, as Spurlock exposes product placement from fast food and soft drinks in family films to sports cars and electrical gadgets in the latest thrillers and sci-fi blockbusters. You then have the blatant product endorsement with film characters appearing on everything from food packaging to clothing. In his travels across America to discover the truth behind this 21st century blight Spurlock quizzes everyone on their views, from some delightfully wacky New Yorkers to top Hollywood director J J Abrams whose films like the Star Trek franchise or television series Lost increasingly use the money companies will pay them to have their product appear for a few seconds on the screen to cover the astronomical production fees. Always happy to practice what he preaches Spurlock uses the premise of producing the documentary to discover just how hard it is to get companies to sponsor him, by persuading them to pay him to use their product on the screen. Though many well known brands turn him down, during the course of the film we see him driving the latest Mini and drinking Pom pomegranate juice at every opportunity (though only after he has pitched his premise to Pom’s board of directors in a selection of bizarre proposals). The best thing about this film however is Spurlock. He enters into everything with such enthusiasm that his audience, both you watching the film and the poor company bosses and film and advertising executives whom he cajoles into taking part in his ‘experiment’, can’t help but be carried along with his sheer verve. That you get the impression by the end that some of the companies who agree to partake in his film aren’t really aware that he’s sending them up, is a testament to Spurlock’s own skills as a salesman – some of them should take him on because this man could sell snow to the Eskimos. For me documentary films are still, for much of the time, a labour of love. Maybe if Spurlock was making them I might be persuaded to watch more.